Come and learn how easy and how much fun rubber-stamping and cardmaking can be! RSVP by March 7 for spaces are limited. Cost: $15 for class or FREE with $60 place this day plus get 1 Free SAB set of you Choice. We will be making 5 different "thank you" cards. Cost: $20 for class or Free with $60 place this day plus get 1 Free SAB set of your choice. Will be making a scrapbook to treasure your memories. This class includes the "Fifth Avenue Floral" stamp set (p.106 in the IBC) and we'll be making 7 projects. This class includes a package of Summer Love Rub-Ons from the Occasion Mini to make the projects this day. We'll be using SU punches to make 5 cards. We'll be making two 12"x12" scrapbook pages. Hope to see you at my upcoming classes! Happy Saturday, stampers! It is not sunny here today but it is nice that it's not raining. I cased this cute little purse from Lynn over at LW Design. This purse uses two envelope dies to make and it holds four 3x3 note card plus envelopes. You can fill it with treats if you like with two note cards in this little purse. Makes a nice little gift to family and friends. The flowers on the note cards and the purse are from the SAB set Polka Dot Punches. I use the envelope dies that Charlotte sent me awhile ago to make the purse. Isn't this purse cute? I love it! Well, I did it! The show went great and there were over 100 brides plus guests last night. This was my first time doing a show so I guess I did pretty good. Thank you Donna and Janice for helping me out at the show! You ladies are awesome! I got to have a display table and a little round table for the make and take. Here is the make and take table. Each brides and guests get to make a tag. It was something very easy and fast cause there was only one hour for them to go look at all the booths. I display all the favours on the biscuits/cookies tier. Thanks for looking and thank you those who came by to visit my display table. Well, I'm finally done creating for the Bridal Showcase and I can't wait to showcase all my SU! creations. This will be fun. I'm nervous and at the same time excited about it. This is my firs time and I hope it will go well. Isn't this cute? This is another sample that I'm displaying at the Bridal Showcase. It measures 3" x 3". It is small enough to carry it around in your purse and show off your beautiful wedding pictures. It is also a great gift to give to your wedding party. Here is a picture without the tied ribbon. Here is the inside. I just left it plain. Don't forget! There is only one month left for Sale-A-Bration. For every $60 you spend you get a FREE SAB product. Take advantage of this awesome deal before the stamp sets retires. Also, if you are thinking of becoming a demonstrator, now is a great time to join. The starter kit is $209 (15% off of $249). You can sign up online over at my demonstrator website. Just click on join under my name at the top right hand corner. You need a password to join and the password is faithful. I can't believe he is 10 years old! Where has the time gone to? We are taking him to Chucky Cheese for his birthday and the closes one is in Langley, we live in Vancouver. Way too far! But it is his 10th birthday so I think it is worth it. I have never been there so it will be exciting. Sorry, for the MLA. I'm busy getting ready for the Welcome Wagon Bridal Showcase next week. But for now I'll share with you a cute card i got from my upline. Isn't it cute? Love those bees! You can find this cute set on page 57 of the Spring/Summer catalogue. Well, got to run as I still have a lot of projects needs to be done. Thanks for stopping by! Wishing you all a Happy Valentine's Day! We didn't celebrate Valentine today. We went to my sister's house warming party. We already celebrated Valentine's Day on Thursday at our church Couple's Banquet. My husband also got me a box of Lindt chocolates for the occasion. They're my favourite. This was a three panel wall hanging for a class last night. Each panel measures 5" x7". We used the ginger Blossom DSP for the background for all three panels. Used the Love You Much stamp set for the sentiments. Punched some hearts out with the Heart to Heart punch and place them wherever you like. Put brads through the hole of the flower fusions and adhere them with mini glue dots. The ladies did a beautifully job with their projects and of course I forgot to take pictures. This project is always a hit. I did this project for Mother's day class last year and all the ladies loved it. I received all these goodies from a blogging friend, Charlotte. Hi, Charlotte! Isn't she sweet? I love all these stuff especially the chocolate covered Macadamias all the way from Hawaii. mmm....yum! There was Top Note dies, mini envelope dies, baker's twine (very nice IRL, good for tags), lunch bags (cut and ready for me to make gift bags with the Top Note dies), note pads for grocery shopping to go with a really roomy grocery bag (the one in the back of the picture with all the foods on it) and yummy treats. Oh! And two cute cards, too! Here is a close up of on of the card. The Japenese doll is so cute! And here are the note pads she made. Small enough to put it in your purse for grocery shopping. For this month's Free Stamp Set of the Month is the For a Friend stamp set. For every $25 you spend your name get put into a draw to win this stamp set. 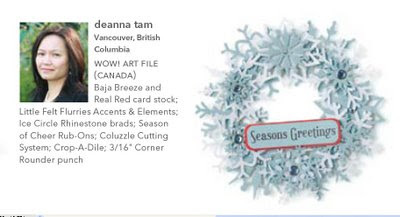 You can order online over at my website, email or give me a call to place an order and I'll put your name into the draw. Don't forget, February 1- March 31 is Sale-a-bration time which means with every $60 you spend you get to pick a Free SAB item from the SAB brochure. Your name will get two chances into the draw. $120 you get to pick two SAB items and your name gets 4 chances into the draw and so forth. How cool is that? I'm making some samples to display at the Bridal Show coming up in two weeks. This will be one of them. I did the diaper fold pouch. I think this can be a nice little favours for the bride to give away at her wedding. To make this, fold a 6"x6" piece of designer paper it in half diagonally. Take one of the lower corners of your triangle and fold it over to the middle of the other triangle side. Take the other lower corner of the triangle and fold it over to the middle of the opposite side. Take one layer of your top corner and fold it down to create your pouch. I filled a cello bag with pink M&Ms, tied with a pink grosgrain ribbon. For the tag I stamped "thanks so much" on whisper white card stock, mounted on a 1 1/4" purely pomegranate circle card stock then onto a pretty in pink scallop circle card stock. I punch little holes to the scallop circle piece with a 1/16" hand held punch. I then punched a flower from the Boho punch, stuck a brad through the flower and through the middle of all the pieces of the tag. Thread a silver cord through on of the holes on the scallop piece and tied the tag to the pretty in pink grosgrain ribbon. I made another Valentine Kit Kat holder. I just love this cute little holder. The accordion flower was made awhile ago. You can view the tutorial here on how to make the flower. I made some of these cards for a friend's birthday coming up. Hope she like them. I used the A Rose Is a Rose stamp set I picked for winning the SU demo only contest. The background paper is the Bella Rose DSP. It goes really nicely with the stamp set. I used the Scallop Edge punch to do the scallop edges. I love this punch and uses a lot. I ordered a new punch called the Eyelet Border punch and can't wait for it to come. I will be using this punch a lot, too for sure. Have a great day and thanks for stooping by! A very simple sympathy card. Something besides a Valentine cards. 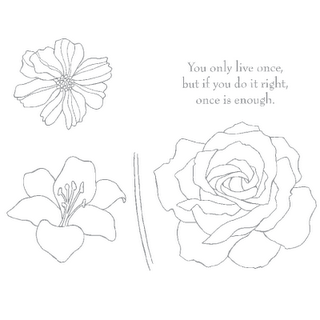 I randomly stamp the flower with the Live Your Dream stamp for the background. I punched the flower with Trio Flower punch in Very Vanilla cardstock and put brads in them. I stamped the sentiment and punched it out with a Key Hole punch. The scallop edges was punched out with a Scallop Edge punch. Can't you tell I love punches. I use punches on all of my projects. Punches are a great way to get your projects done in a jiffy and look nice too. First time altering a clipboard. It was so easy and fun. I need to make some for a Bridal Show coming this February. The the bride-to-be can use it to fill out a door prize form. I covered the clipboard with the Berry Bliss (retired) paper. Then, I stamped the "enjoy" in the middle of the clipboard. The little red flowers on the pink paper was a stamp from the Enjoy Every Moment stamp set. Now I need to make a matching pen to go with it. Better get creating. A simple Valentine card. I used the Love You Much stamp set from the Love You Much bundle back in January when it was 20% off. I stamped the big heart, cut it out and mounted on the Pretty In Pink cardstock. Next, I stamped the little hearts from the stamp set and punched them out with the Heart to heart punch. Then I adhered the little hearts to the card. If you click on the photo for larger image, you'll see I used a marker to draw the polka dots around the "i love you" sentiment. It made the sentiment looked a lot better. This card was made using the new level 2 hostess set. All of SU stamps are die cut now so I saved the rubber and made a shaker card. I stamped the hearts from the Love You Much stamp set and punched them out with the Heart to Heart punch. I then put the hearts in inside the heart image and sealed it with a cello bag. Looks nice but doesn't shake too well. The hearts keeps on getting stuck to the sticky foam. Next time I'll use beads. Here is a close up of the shaker card. You can see the hearts inside the shaker heart. I cased this card from Angie Juda. Very simple card. It measures 4 1/4" x 8 1/2" and scored at 3" and 6 1/4". You can put a treat or a gift card in it. Got a BRAK (birthday random act of kindness) from Rita. She sent a beautiful card and all those cute images for me to play with. I'll be making some great cards with them. Thank you, Rita! These are such cute purses! The lace edge are so pretty! ...to show you my winning project. Here is the photo of the project I submitted for the SU! demo only contest back in December. I made a wreath using the Snow Flurries. Isn't pretty? It was easy to make. As a winner I got to pick three stamp sets at any price from the Idea Book and Catalogue. How cool is that? I love free stamps! Demonstrator Starter Kit Special -- 15% Off Plus a FREE Stamp! Whether you want t a fun and flexible career with Stampin' Up! or simply some great products at a terrific discount, I can help you. 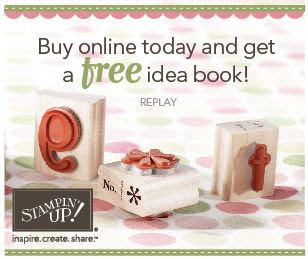 Jump start your creativity today with the Stampin' Up! Starter Kit! 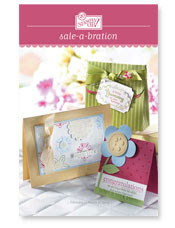 From February 1- March 31, for every $60 you have order in catalogue merchandise, you get to pick out something FREE from the Sale-a-bration brochure! How easy is that? Just go to my website and place an order online or contact me directly and I will place the order for you. If you order $120, pick 2 items from the catalogue. $180? Pick 3! Want more? GO CRAZY!!! There's no limit! Just click on the brochure to see what's inside. During these months is a great time to hold a workshop also. 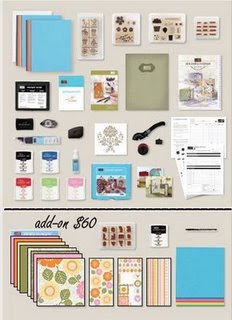 Hostesses get a FREE Sale-a-bration stamp set with a $350 workshop along with all the other hostess benefits. Invite all your friends and family and they won't be able to resist the great FREE products.